Plus Size Kitten: What do you think of certified organic skincare? Another giveaway! 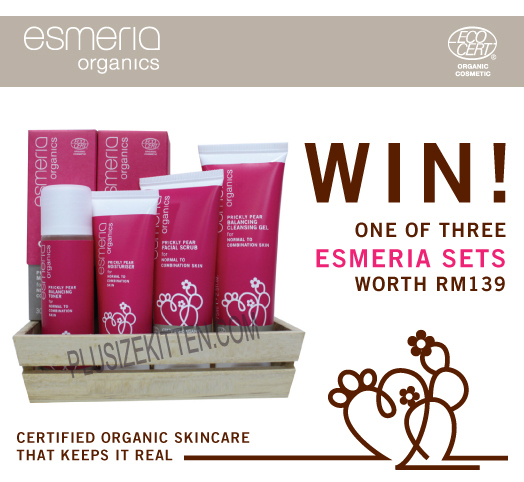 oh my this month I have so many giveaways on my blog & THREE (3) ESMERIA ORGANICS HAMPER worth RM139.60 to THREE (3) Lucky FOLLOWERS of Plusizekitten.com. Yeap and you don't believe me do you? Seriously with the surge of organic skincare in the market, you gotta try this one! I fell in love with the scent and wonderful creamy texture of the products. I'm really picky nowadays with skincare, especially since today's newspaper banned 7 beauty products in the market that contains harmful chemicals! How to Win Awesome Esmeria Organics Hamper worth RM139.60? leave a comment here on the topic of What do you think of Certified Organic Skinare? leave your follower id & email so contact if u win! Contest starts 21/4/11 - 24/4/11 midnight -- awesome? Esmeria Organics will contact the winners to collect prizes! so u don't have to wait for me to post to you coz I don't live next to the post office. That's Not All! 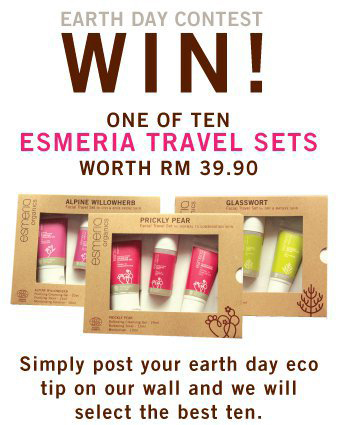 U can also win a Esmeria Organics travel set worth RM39.90! There's 10 to giveaway! read the fine print here okay? Go to Esmeria Organics FB page and like the page and participate in the FB page contest. Ten travel sets are up for grabs! (cute travel sizes are awesome travel buddies). Just post your Earth Day Eco Tip on the wall and keep your fingers crossed! 1) with the increase of the certified organic skincare in the market, it's important that the public be well informed with what's available out there. some brands use the word "natural"/"natural ingredients" on their product instead & make the public believe that it's organic..which is not true. companies/distributors should organize more workshops to educate the public & spread the awareness of genuine certified organic skincare so that the consumers are more aware of the choices available out there.. I have sensitive skin all my life, and could never really find the suitable product out there. With certified organic products, I am confident and will feel safe whenever I use the products, with less harmful ingredients and more natural goodies, I'm hoping that it will help me to reduce my skin's sensitive problems. I believe that Certified Organic Skincare is safe for the skin because there is no mineral oil, SLS and other dangerous ingredients like hydroquinon that is harmful for the skin. I think that Certified Organic Skincare is earth friendly i.e. free of chemicals during planting and harvesting the raw ingredients. Therefore, by using them, we are conserving our mother earth. By using certified organic skincare, our skin will have a healthy glow that it deserves. What do you think of Certified Organic Skinare? I love organic skin care series which have lesser or even does not contain any chemical that will bring some side effects on skin. Moreover, they Esmeria provide a wide range of skin care serious that suits all of our skin requirements. Love the earth, love natural, love Esmeria. A skincare range that not only thinks bout YOU (i.e. pure, natural & organic product for your delicate skin), but because it is organic, it thinks also about the FUTURE GENERATION. Afterall we have not inherited the Earth from our fathers, we are borrowing it from our children! For the love of our skin, love of beauty & nature, love our Earth - choose Esmeria! Certified Organic Skincare is meant to love your skin and care for the Earth at the same time. By using certified organic skincare, you are rest assured that your skin is getting the purest and most natural skin food. Without the harmful chemicals and artificial ingredients, your skin smiles with healhty radiant glow. The Earth will thank you for saving the nature for the future generations. Certified organic skincare products are made to keep your skin healthy and safe in use. If you want to prevent damage and harmfullness to your skin, you should use organic skincare products on it every day.You might think of high prices, but it's good if you look at safety perspective: you cannot put a price on your safety and health. The only way prices will go up is if damage goes up. They often say that beauty comes with a price! I think it is unfair for Mother Nature to pay the price too. So support organic products, support Esmeria Organic Skincare. All natural, organic ingredient for your skin in their skincare range. Organic definition is produced by the organs; as, organic pleasure. If that add in with the word Certified, then for sure I have NO DOUBT using it!! Certified Organic Skinare has no harmful ingredient, it is certified organic skin care. I have been looking for suitable skin care product all my life as I have sensitive skin. Certified organic skincare assures me that it is safer for my face and is less harmful to the environment as well. When we take care of the environment, it will benefit us and our children. By using organic skincare, we are putting less chemicals into the world and consuming less chemical ourselves since we eat and live on the same ground we throw the chemicals on. Certified organic skincare must be 100%-ly FREE From paraben, mineral oil/petroleum jelly, Sodium Lauryl Sulphate (SLS), chemical forming agent,any artificial fragrance and color and any other harsh chemical. besides that, their packaging also must be 100% recyclable. and the whole process of making/producing the products should be done handmade-ly. i love certified organic skincare because its all natural. i hate the feeling of putting chemicals substance on my face. I think certified organic skincare is a skincare range that without any harmful chemical that all the ingredient used was approved organic. Then the skincare is much more better to our skin since it is 100% natural. We all want healthy lifestyle, Organic foods, organic drinks, organic this and that. But most product that we applied on our skin are not that environmental friendly or so called organic in term for their ingredients. Certified Organic Skincare gives me the confident that whatever i applied on my skin is pure, natural, organic and most importantly it would be risk free from damage towards inner skin. a) What do you think of Certified Organic Skincare? For me, Organic Skincare is those skincare that its product development is rigorously monitored with the seed that how it is grown,harvested,stored, transported and processed from the beginning till the end. Besides,each stage is completed according to the international standard then it will display the 'certified organic' logo is given certified logo. Since nowadays the issues of global warming is getting serious, and people is more concern about eco-friendly and safe earth, I believe no only from reducing consumes meat but vegetable, reducing ride own transport but public transport or car pool, encourage using fan instead of air conditional, and also less using tissue but drying machinery after toilet, so we maybe can also change to use certified organic skin care to which reduce harm and damage towards our skin. All of us love ORGANIC! The real love from us to ourselves and for mother Earth is of course by going green and organic...But how far does skincare following organic definition? So, certified organic skincare is coming to the rescue.Esmeria with certification is just like an electrical appliances with Sirim sticker on. You are convinced with it? Yes, i am sure the consumer will! certified organic skincare makes me thought of the ingredients used are all natural and would not cause sensitivity to our face & for ppl who have a sensitive face type like me will certainly go for it!